Sierra Nevada Brewing Company made its first-ever acquisition today, fully buying a California company that has focused on low-ABV and gluten-free beers. Financial terms of the deal for Sierra to wholly buy Sufferfest Brewing were not disclosed. A press release announcing the new partnership stated the two companies’ “shared values, commitment to innovation, and common goals” as the root of their new business connection. Those values are hung directly on the ideals of fitness. While many media outlets have rightfully pointed toward the impact on the future of Sierra's portfolio, one overlooked connection is the direct connection between Sufferfest founders and their past as fitness marketing executives. It comes at a time when health and wellness are front-and-center across the food and beverage space, and niche brands with specific marketing expertise in this area show real promise—especially if they have an exit strategy. Founder and CEO Caitlin Landesberg started Sufferfest in 2016, naming the company after her love for long-distance running and endurance sports. She had started homebrewing in 2012 with an eye toward creating gluten-free beers after she discovered her own intolerance toward the protein. Before launching Sufferfest less than three years ago, Landesberg spent more than a decade in consumer marketing, mostly in-and-around Silicon Valley. In a May 2018 interview on the Dirt in your Skirt podcast, Landesberg described herself as a “high-tech brat,” having focused her entire career on such marketing at different companies in California, including Mozes, a mobile-engagement company, Mozilla, best known for its Firefox browser, and Strava, a mobile app for athletes. Running her self-distributed brewery was a new challenge, but in that interview Landesberg said that she had 30 accounts set up on the first day of operation. Those accounts grew to 300 by 2017, stretching from Tahoe to San Diego. By last spring, it had ballooned to 700. Alyssa Berman, who lists herself as co-founder and vice president of brand from December 2015 through July 2016, also came from Strava. Before that, she had spent six years at PowerBar Inc. as a brand manager for the health bar company, and later spent four years in brand marketing for Clif Bar & Co. She currently works as an innovation and product development consultant. It hasn’t been the best few years for Sierra Nevada sales, but after the company celebrated 0.2% volume growth from 2017-2018, it clearly sees 2019 as a year of ambition. Given the rapid increase of interest in various “better for you” beverages—from non-alcoholic to gluten-free to ASMR-embracing power brand Michelob Ultra—this comes across as a smart play for the heritage craft brewery. Sufferfest made about 3,000 barrels of beer in 2018, according to numbers reported by Brewbound, and Sierra expects that "growth to accelerate" this year. Sierra Nevada CEO Jeff White coyly referenced Sufferfest as a possible national brand to the outlet, although one that needs to be built smartly. Given the fast growth of the company, it wouldn’t be too out of character, however. In an interview with the San Francisco Chronicle, Landesberg said that she’s “not a serial entrepreneur” and “didn't see a gap in the market,” but given her extensive history in fitness marketing and noting that she grew up among the culture of Silicon Valley, maybe it was inevitable that she and her business partners would just be exceptionally good at this. Landesberg was among the first group of employees at Strava, where she said she was “willing to work for cat food” in order to get in on the ground floor. That platform has turned into a massive success, and has claimed it adds 1 million users every month-and-a-half. The gamble clearly paid off then, and is set up for a second time around with the sale of her company to one of the largest craft brewers in the country. She told the Chronicle that investors had already been making offers to Sufferfest, but nothing seemed to fit until Sierra came along. "I definitely believed that Sufferfest would align with a partner at some point because of the nature of this business and the economies of scale that we face,” she told the publication. In terms of broader consumer interest in products that align with health and wellness, it also offers a strategic position for Sierra Nevada, given Landesberg’s approach that making a move internally into this space “wouldn’t be part of their DNA,” as she told Brewbound. As a category, gluten-free or -reduced beers have shown steady growth in recent years, though 2018 did slow a bit. The three-year trend for volume sales of major brands, which include the likes of Omission, Redbridge, New Belgium’s Glutiny line, Stone Delicious IPA, and more showed promise. In IRI-tracked grocery, convenience, and other stores from 2015-2018, these beers showed 13.6% increases with a 20% jump in dollar sales. Things were a bit less enthusiastic for the 2017-2018 change, with 3.2% growth in volume and a 4.6% increase in dollars. What that does show, however, is there’s room for some more competition. Growth in the category is almost entirely driven by Stone’s gluten-reduced IPA, and a direct competitor could be enticing for Sierra. 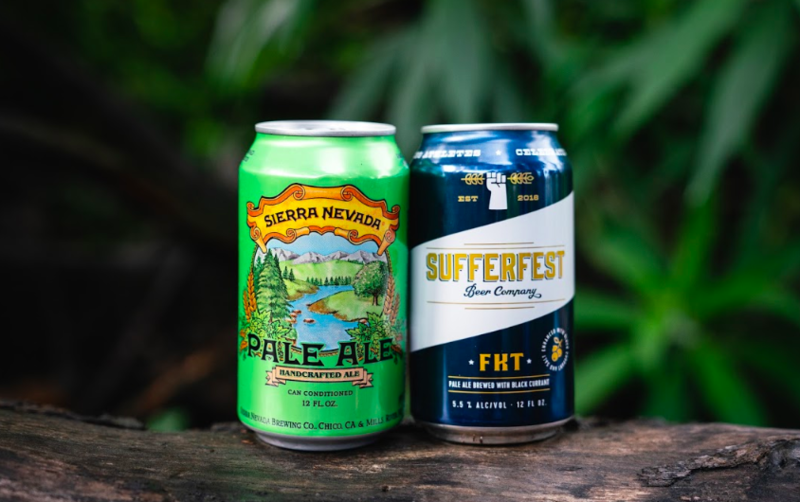 Sufferfest currently offers two hop-forward products, including a 5.1% ABV Pale Ale, FKT, and a 7.5% ABV West Coast IPA the company describes as “a walk through the coastal redwoods” given its “citrus, pine, & resin notes.” The core lineup also includes a Kolsch, Blonde, and Pilsner. The acquisition creates a great situation for both companies. Landesberg’s tech and fitness marketing background, where fast and enthusiastic growth can be the norm, paired with Sierra’s interest and need to diversify its overall offerings at least sets up Sufferfest with the potential to make some big moves. And California, regularly ranked among the healthiest states in the country, is an ideal proving ground for a health-focused product like this. One website that provides gluten-based information even calls the state a “health and wellness mecca” for those who are intolerant of the protein. Given the strong fitness lifestyle angle to the brand, this acquisition could open a variety of possibilities, from simply expanding its reach as a gluten-free beer to potentially taking on Michelob Ultra and similar beers in the niche "fitness beer" space. How that grows out of the Golden State is a whole other question. But if current trends continue, and Sierra can continue to market and grow Sufferfest on the same trajectory it’s already placed itself, the purchase of the upstart company could become something big based solely on what it removes from its beers.